Many architects, planners, and designers are taking ideas from nature when constructing new buildings, a concept known as biomimicry. For example, a building in Harare, Zimbabwe, uses air channels and tunnels inspired by anthills to keep the building cool passively, without the need for air conditioning. 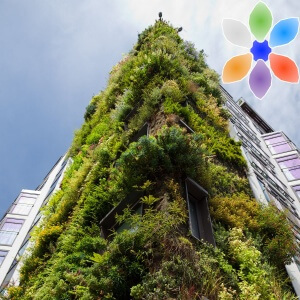 Other innovations include covering buildings with vegetation to cool and clean the air, using energy-efficient LED lighting and sensors to reduce energy use in empty rooms, and even bringing urban farming into the mix by, for example, using lemon trees as partitions between desks.